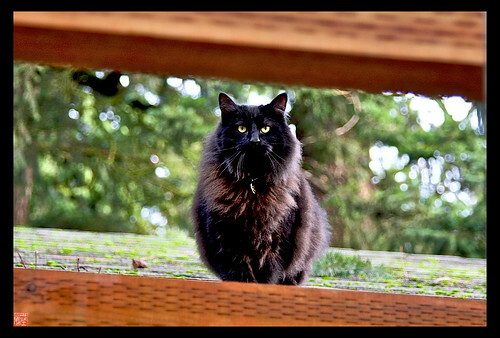 Home Cover Feature CAT ON A COLD MOSSY ROOF…Barklay returns!! 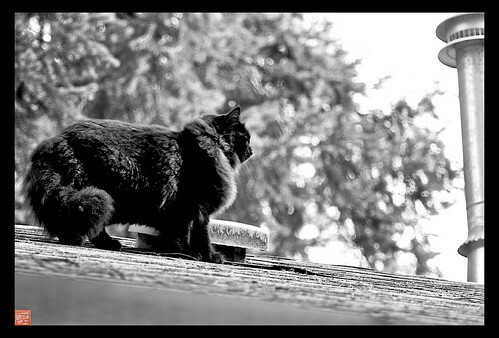 CAT ON A COLD MOSSY ROOF…Barklay returns!! Listen to todays phone cast below to hear all about how I ended up with these photos!! HIS COAT IS LOOKING SO PRETTY IN HIS WINTER WEAR!! Yesterday my new bag arrived from Ebags.com !! This is the 25″ version of my 21″ carryon. I was SO impressed by the smaller bag on our Egypt/Turkey trip but needed a sturdy larger one for this trip….this was a NO BRAINER!!! LOL!!! Jeanette I am so glad you got to see these photos!! 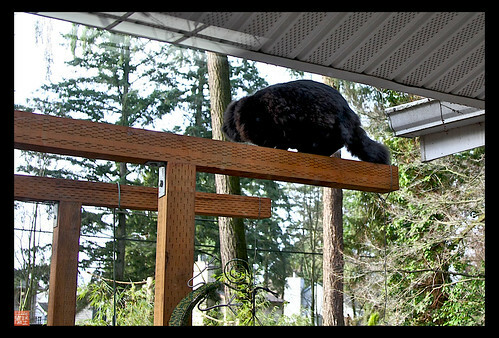 I was mortified at first thinking my dogs were scoping him out, but he’s such a smart cat…..he has never taken any unnecessary risks as far as I’ve seen. I reached up to pet him and I could here his “motor” from the roof!!! His fave thing to do is have me lift him up to peek in the garage window. I’ve sure missed that boy in this rainy weather. His appearance made my day…just ask Diana who got to hear the gasp in the phone when I saw him on the feeding station…lol! She said she could hear my camera clicking. Have a great day Jeanette!!! Barklay! What a cool mister kitty!!! How beautiful Barklay is! We have seven cats out here on the ranch and each one has such a distinct personality. 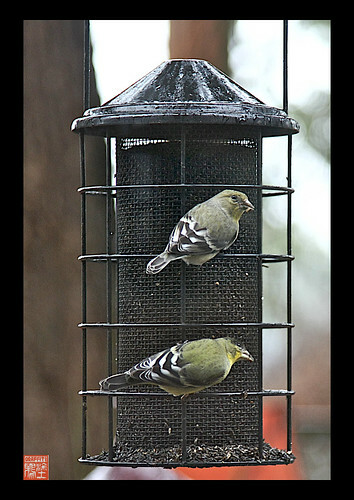 You should see them watching the hummingbirds in the spring and summer! Beautiful pictures of Jeanette’s Barclay – he’s such a good kitty!!! Those are great shots!!! HI Bonnie , Gwen and Rita!! Gwen , that was actually what Barklay was after was my Annas humminbird on the feeder. Those birds are so fast but the cats still think they can outsmart them!! Rita thank you!!! He’s the BEST kitty on the planet!!! Even as allergic as Steve is to cats, he can’t keep his paws off of Barclay. We’ve really missed him in this rainy weather. wow…its been forever since Ive seen Barklay. i think the last time was when you got that new car and he was having a nice nap in the back seat.!! 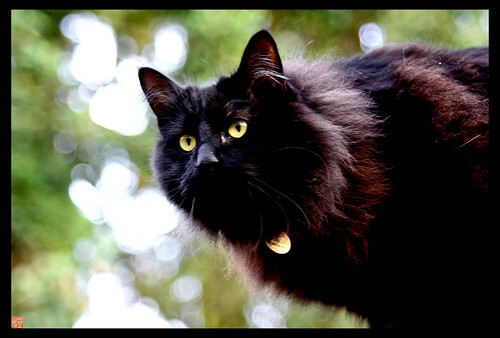 he sure is a gorgeous cat…….all that thick fur and a tail to die for. My Chloe never gets out, but she enjoys her birds at the feeder from my studio window. she even “chirps” at them. i wonder what that is…….its a sound that reminds me of a bird, and i think she is trying to lure them. i would love to dig my fingers into that fur of Barklay. his eyes are mesmerizing!!!! its exciting to see you getting all ready for “our” next trip…hahaha. Love to watch cats do their “cat things”. They are soo much fun to just sit and watch. 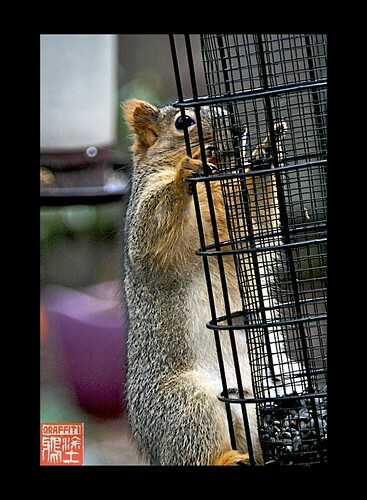 ANd that squirrel is a little bad boy too, stealing the bird treats! One day the birds may just fight back. Sorry for being a stranger of late…my pc broke and can’t replace it at this time so I am on a borrowed laptop that is slower than molasses! Getting ready for the big trip I see, can’t wait for all the updates when you go! Don’t have your email addy but I added mine to this laptop, if you can email me plz……. Hi Kathe, Nan and Vonnie!!! Thanks a ton for stopping by!!!! It took me forever to reply here, …my apologies!!! Vonnie I’ll write you now!